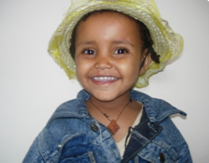 Ananyia Yisihak is a 4 year old boy from Metehara, 200km south east of Addis Ababa. He was born with bilateral cleft lip and palate. He first visited our hospital, Yekatit 12, as a 6 month old in 2009 and has since has both his lip and palate repaired. He is now attending speech therapy treatment. Lamrot Negussie is 4 years old. She is from Debreberhan, 120 km north east of Addis Ababa, Ethiopia. She was born with a cleft palate and first visited Yekatit 12 Hospital in 2011, when she was 2 and a half. Her palate was repaired at Yektit 12 Hospital that same year. After surgery, she has been following up at our speech therapy unit. Her parents reported that she started to communicate better and have noticed the improvement in her speech. Both her parents were very happy and thankful for the coordinated multidisciplinary service they received.